What is the Significance of Jesus’ Death and Resurrection? 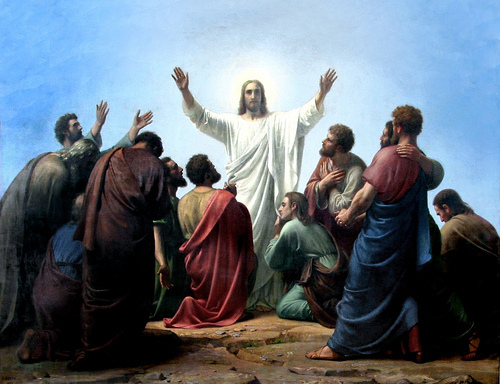 Recently, a reader asked me a question privately about Jesus’ death and resurrection. I plan to do a series in the future, but that won’t be for a while. But because it is such an important question, I decided to post my response to her. It has minor edits to make it more appropriate to a larger audience, and her name is changed as well. You have not asked an elementary question, and I have not addressed it substantially on my blog. So I reflected on it several days to determine the best way to answer. This is an excellent, and important, question. It is also a difficult one, and I am not sure we can discover a definitive answer but, as a fellow traveler, I will share my thoughts with you. Since I don’t know what your thoughts and research have been, I will probably say things you already know. What does the resurrection of Jesus mean in light of all of this? I mean if there is no “sin” that required Jesus to die for us then what does the resurrection mean for us? I think it interesting that your question is about the resurrection, while most would focus on the cross. But I believe the resurrection is the more significant event. Of course, this has to do with our understanding of how Jesus’ death and resurrection changed things for us. As a fundamentalist and a conservative evangelical, I assumed that I knew exactly how the ‘atonement’ worked; indeed, I was not aware there was any other explanation of Jesus’ death and resurrection. After Jesus’ death and resurrection, his followers grappled to understand who Jesus really was and to describe the significance of his death and resurrection. They felt that it changed things for us, but they had little vocabulary to explain it. Paul, in particular, expressed it in different ways using a variety of illustrations. After Paul, church leaders continued to try to describe how the atonement worked. Because of Paul’s illustration in Romans chapter 5, where he talked about Adam in Eden (see the section ‘Paul and Original Sin’ in my post on creationism), many of the theories were based on Adam or Satan. The view held by the earliest church fathers seems to be the Ransom Theory which sees Jesus death as a ransom of mankind from the devil. It was later modified into the Christus Victor Theory which emphasizes Jesus’ victory over Satan, sin, and death. There are other theories as well, and many believers embrace parts of more than one theory. Though I can accept some language from different views, I cannot see how any view based on appeasing God is valid. The Father is not angry with us; rather he wants to bring us love, reconciliation, and inner peace. This is part of the good news Jesus came to tell us. There was no need for Jesus to be punished in any way for our sins. Jesus accomplished much of his work by telling his followers of the loving Father, taking away their feelings of guilt and fear, and teaching them how to relate to the Father and other people with love and reconciliation. In this way he established a community of those who follow him and live according to his code of behavior—genuine love. At the same time, I think Jesus tells us of an eternal community of peace and reconciliation in the after life that begins at our resurrection. This part of the good news is established and demonstrated in Jesus’ resurrection, which was a victory over death (not Satan). We can now look forward to our resurrection and eternal life of happiness. Jesus’ death might have happened for more than one reason, including Roman and Jewish response to Jesus’ advocacy of a life that seemed threatening to the political and religious power structures of the day. One thing is certain, however: Jesus could not have been resurrected unless he died first, and his death was too public and graphic to be doubted by his followers or those who soon became his followers. The prospect of our resurrection and eternal life is confirmed by Jesus’ personal victory over death. I hope this helps you in some way as you deal with your question. I would love to hear your thoughts on it. Do not hesitate to ask me further, if you think I can be helpful. I invite your comments and observations below. If you enjoyed this post or found it helpful, please sign up in the column to the right so you don’t miss future posts. This entry was posted in atonement, eternal life, Jesus, Paul, resurrection, sin, the Good News and tagged Christus Victor, Penal Substitution, Ransom Theory of Atonement, Satisfaction Theory of Atonement. Bookmark the permalink. 50 Responses to What is the Significance of Jesus’ Death and Resurrection? I personally believe that Jesus died because he threatened the authorities of the day. I believe that he was resurrected and reunited with the Father. If this is a victory it is a victory over those authorities and their murderous methods. If Jesus is the agent of our resurrection I would be interested to know what you think happened to those who came before Jesus and those who worship God through other religions? Did they go to heaven or hell or somewhere else? I think Jesus’ resurrection demonstrates his victory over death and establishes our resurrection and eternal life, and I believe this applies to all those who ever lived. Eternal life of peace and happiness is for everyone unless there are some who reject eternal life, in which case they will not be forced to live in the Father’s community against their wishes. Thanks Tim for the clarification. Where does that leave the people who never hear the Gospel; they have no opportunity to reject eternal life? I think all people will have opportunity to accept or reject the offer of eternal life at their resurrection with a full understanding of what it means. Among the ancient Christians there was an understanding that the soul and spirit entered the spiritual realm alive and conscience upon the death of the body. When Jesus entered this spiritual realm of the departed (Hades or Sheol) upon His death on the Cross, He preached the Gospel to all humanity clear back to Adam and Eve. The net effect of this became known as “The Harrowing of Hades.” When Jesus ascended forty days after His resurrection, most, if not all, of the former inhabitants of Hades experienced the first and spiritual resurrection to the Church in the heavenly Jerusalem. Since AD. 33 those who are baptized into the Christian faith also experience the first and spiritual resurrection to some degree. Those who do not hear the true Gospel in this life, are fully illumined when they enter the spiritual realm upon the death of their bodies. This partial or particular judgement is likened to diagnosis and treatment leading to their experiencing the first resurrection as new members of the heavenly Church. The Church in heaven just keeps growing, no matter what happens here on the earth. Thank you Marc for the illucidation. This is very good. I’ve often wondered about the OT system of sacrificing animals for sin. How can a bloodied ram “save” someone? It seems primitive, even pagan, to me. I love this post, for it offers a variety of views. I’m still not sure where I stand on this need for blood to be shed. Had Jesus been hanged by the neck, and then resurrected, wouldn’t we all still get the benefit of his resurrection? Sheila, I agree that the idea of blood sacrifices are primitive efforts to appease God (or the gods). I believe further that New Testament writers did use the imagery of Jewish Temple sacrifice to illustrate, but not explain, the impact of Jesus’ death and resurrection. Illustrate, not explain. That’s a very helpful distinction. Thank you. I seem to recall some Christians believing that God actually cannot forgive sins without the shedding of innocent blood (covered for us now of course by Jesus’ sacrifice). Can’t cite a source. I find this idea (not the bit in parentheses) absurd, partly because it offends my sense of who God is (love and grace) partly because some biblical writers railed against it! “Do I eat the flesh of bulls or drink the blood of goats?” (Ps. 50:13) for instance. I agree. There are a number of passages in the Bible which reject sacrifice in favor of changing the way we live our lives. This is what God wants, not empty ritual. Michaeleeast, you referred earlier to the Jewish leaders “murderous ways” and now call their ritual “empty.” There was corruption (but murderous acts?) in Judaism as there is in Christianity. Maybe for some priests, ritual was empty. I just hope you don’t think that applies to all Jews of the time. Alan, when I was a fundamentalist I heard this preached all the time. Preachers often accused liberals of taking the ‘blood’ out of the Bible. One of a number of songs we sang supporting this idea was “There is a Fountain Filled with Blood”. Let me say that we were simply celebrating what Jesus did for us in the misguided imagery we understood. Here is a more recent video of that song. You can listen to the entire thing, but the idea is clear in the first few seconds. https://www.youtube.com/watch?v=9qug45x9hgg. Your reference to ‘Deep, deep magic’ reminds me of CS Lewis’ scene in the Chronicles of Narnia where Lewis was embracing a Christus Victor approach of victory over evil (the White Witch). While I don’t claim to know details about the many mysteries beyond our conception of reality, I think Lewis’ metaphor is good so long as we understand his personification of evil as a metaphor and not as Satan. Accepting that it was certainly necessary for Jesus to die, because he was human, can we believe that a gentle, loving God would allow him to suffer the most agonizing form of death ever invented by mankind. Wouldn’t that be perverse? Chas I really like your assumption that Jesus had to die at some point because we all do. I agree with you. The question about God allowing suffering can apply to ALL suffering and has been a source of intense discussion for many centuries. I believe the Father allows humanity to go their way with little interference, and his big moment of interference was having Jesus to tell us the good news, which included insight into how to relate with each other without oppression and cruelty. This is supposed to be a major element in the community of followers on earth, but it will not likely come to full fruition in humanity until the eternal community of the Father is established after the resurrection. Tim, I believe that God allows us free will to suffer or not. He does not usually intervene unless called upon. His time of intervention in Jesus is unusual. I believe that a new intervention is currently taking place which will eventually lead to a New Reformation of Christianity and a profound interfaith dialogue which will lead to a universal religion based upon God’s unconditional Love. Michael, I hope you are right about a universal religion based on God’s unconditional love, but I am not so optimistic. Humanity is too consumed with power, greed, and fear. “Tim, I believe that God allows us free will to suffer or not” Do you believe we choose illnesses, such as cancer, or diseases such as diabetes? Or the suffering inflicted on us by others. I live and work in a part of Asia where little children do not choose the suffering that adults inflict on them. An adult may choose to walk and abuse through a red light area. The child does not always get choice. Or many of the grown women for that matter. Tim, I notice on a couple of occasions here, you seem to believe in the resurrection of all souls after death, rather than an alternative in which all (other than those who have been brought into the Presence of God) go to nothingness, am I right? Chas, I think that there must be a time when every individual has opportunity to make an informed choice whether to accept or reject eternal life in the Father’s community. Further, I believe this will be done with a mind clear of misinformation and misconceptions. I do not know how or when this will occur, but the best candidate for such an opportunity seems to be a general resurrection of all deceased people. I further speculate that those who reject eternal life will at some point cease to exist. See my post at https://jesuswithoutbaggage.wordpress.com/2013/03/25/who-would-reject-the-father/. If everybody is not to get the choice in the way that you have outlined, it would imply that God has made a judgement already: from the way that we have lived our lives, taking into account the ‘hand’ that life has dealt us from our beginning. Certainly we could all find an example of people who seemed to have everything, yet have acted in ways that make the lives of others miserable, but others, who have had a miserable existence, yet have made the lives of others most pleasant. God, who sees the beginning and end together is in an unequaled position to make such a judgement ahead of our end. Any thoughts? Too close to Calvinism for me. Chas, I agree that the Father understands us completely–far better than we understand ourselves. The supposition I have difficulty with is that if we do not consciously accept the Father’s offer of eternal life before we die we have no further opportunity, even though it is due to misinformation, misconceptions, or psychological twistedness. Your proposal that the Father understands enough about us to determine our clear-headed decision in advance might be valid, but only if it preserves free will. Thanks for sharing this link, Jane. I read the post and really enjoyed it. I recommend it to any of my readers who are interested. – give up our own priorities and submit to God’s will for our life (Philippians 3:7-9; cf Luke 22:42). * “Those who try to make their life secure will lose it, but those who lose their life will keep it” (Luke 17:33). * We realize the kingdom of heaven within us (Luke 17:20-21). * We truly experience the joy of our salvation (Psalm 51:12; cf. John 15:10-11; Philippians 4:4-7). * My Father is Greater than I (John 14:28). * I and my Father are One (John 10:30). * My neighbor is myself (cf. Mark 12:31). – We are members, one of another (Ephesians 4:24-25). – What is done to the least of these is done unto me (Matthew 25:31-45). Take up your cross–the kingdom of heaven is at hand! Did you mean the meaning OF life? I believe it is different for each individual person, depending on that person’s design. We have had great researchers who have contributed to the well being of mankind, volunteers who impact lives at risk, great leaders that move people out of harm’s way, etc.. THE meaning of life itself, I think, is to contribute in any way one can to the well being of others. The meaning of life is to develop a loving heart. Love is the source and the purpose of life. Cherie, just as it is in among animals I think the basic meaning of life is to survive and propagate. However, humanity has advanced far beyond these basic needs, so that for many the meaning of life is found in ego-driven desire for security, power, and accumulation of important assets and resources. Others seek higher objectives such as justice and relationship. With the coming of Jesus, who told us the good news of the Father’s love, we respond to the Father’s love and become able to love ourselves properly and to begin loving others as we love ourselves. Following Jesus, personal growth, and living a life of love and reconciliation is at the center of the meaning of life for me. Thanks Yeshua. This is an interesting organization of biblical passages, but I am not certain what you are saying. How do you understand these things to play out in real life? Thank you, Tim. Real life is not what we think… It is with us always, but we become “lost in thought” (like the “ghosts” in C.S. Lewis’ “The Great Divorce”). They have access to heaven, but are more interested in preserving their imaginary life in hell. To enter the kingdom, here & now, we must die to our carnal/egoic mind and abide in the light of Divine presence which is with us always. It’s hard for us to kick against the goads! Yeshua, I find that quotes and allusions can be very helpful to introduce or to illustrate a point, but it is difficult for me to grasp what an author intends to convey when the writing is composed almost entirely of quotes and allusions. A lot of Christian writers do this with biblical passages and it isn’t very helpful to me. After reading your comments and the two articles you linked to your blog, I think I might understand a little bit better what you are saying, but I have to guess what the quotes, allusions, and biblical passages mean to you. However, you seem to have something of value to say; I would really like to hear your voice on the matter. “The take-home lesson from all of this is NOT that Eckhart Tolle should be promoted or that his teachings should be believed… Nor that we should seek to understand his teachings in relation to any other teaching or conceptual scheme… Rather, the good news– if and when we are ready to hear it –is that we are not merely the body that we see when we look in the mirror… And we are not merely or even primarily that which we think ourselves to be–not the “mind-made” sense of self that suffers so… Rather, we are the light of aware presence or the field of alert stillness in which any and all phenomena appear… Indeed, walking in this light, it can be seen that we are both this field of awareness and all that appears therein… In short, we are the NOW. “In the course of time, one seems to grow more established in this insight as the “ego” assumes its proper role. No longer sitting on the throne of our heart, the egoic mind is now content to be a servant– the servant of awareness –our servant. No longer the slaves of a self-absorbed and tyrannical director of a largely fictitious drama, we now recognize ourselves to be the light of the world and, by virtue of this recognition, enjoy the peace that passes understanding. “Moreover, it turns out that the light of awareness is the source of a much deeper and much more profound intelligence than the cleverness of the egoic mind. As such, once we learn to lean into this moment– to bring all our problems into the light of aware presence rather than attempting to magically escape them –intelligent solutions often appear of which our impatient and desperately evasive ego would have been totally oblivious (if, as in times past, it was attempting run the show exclusively by and for itself ). Hi Wayne, I have visited both your blogs before, but I did not realize they were written by the same person. I have also encountered your Yeshua persona both on my on posts and on other blogs. I read the two links you suggested as well as some additional posts, so I now have a better understanding of your frame of reference. I also now understand your choice of evangelical idiom for your Yeshua persona due to your target audience. I almost do the opposite by not embracing evangelical idiom, except as a point of reference, due to my intended audience. I prefer Wayne to Yeshua because I guess I am not part of Yeshua’s target group. Thanks for clarifying and I hope you continue to visit here! I love that you shared my question. I would not have minded if you used my name. 🙂 You are a wonderful source of help to me. Thanks again! Thanks Scribe. I started to ask you ahead of time about using your name, but I wanted to post it quickly. It is an excellent question; thanks for asking it. Not only that, but it dovetailed nicely with my question about OT sacrifices. I agree that the Jesus’ sacrifice on the cross was about life and death, not morality. Jesus died, conquered death, and rose again, to give us eternal life. I grew up on a farm and I know in a literal way, that every day creatures die so that I can live. To me, this is central to the why animal sacrifice took place. We sacrifice animals as food so we can live physically. Jesus sacrificed Himself and offers His body and blood as spiritual food so we can enjoy eternal life. Still, the Bible says that He became sin for us. I’m kind of confused when you say that there is no sin. If Adam and Eve hadn’t sinned, people wouldn’t eat meat. No animal blood would be shed as food for human beings. Sin and the need for blood sacrifice are coupled from the beginning. God gave them the skins of animals to cover their nakedness. When I say there is no ‘sin’ or ‘sins’ I mean that we should not be obsessed with avoiding infractions of legalistic religious rules to which we think God is holding us accountable. This is not the way Jesus taught us to live. Instead, he taught us by word and action to love other people and treat them right. This should be our way of life. Even though I acknowledge that our lives are messy and filled with pain, distress, and alienation, I do not believe we are cursed with some original sin from Adam. In fact, While the story of Adam is very useful to us I don’t think Adam was an historical figure at all. He is just a character in a story–like Huckleberry Finn. So I cannot agree that we eat meat because Adam sinned. But of course I very much agree that “Jesus died, conquered death, and rose again, to give us eternal life.” And this is what calls us to peace, love, and reconciliation. These are the things that should concern us–not fretting about ‘sins’.